The picture is of the Midland Railway horsedrawn van at the Hednesford depot. Robert Ives visited the museum last Sunday, May 12th. The work on the Andrew Barclay loco (Colin McAndrew) at Hixon is almost finished. 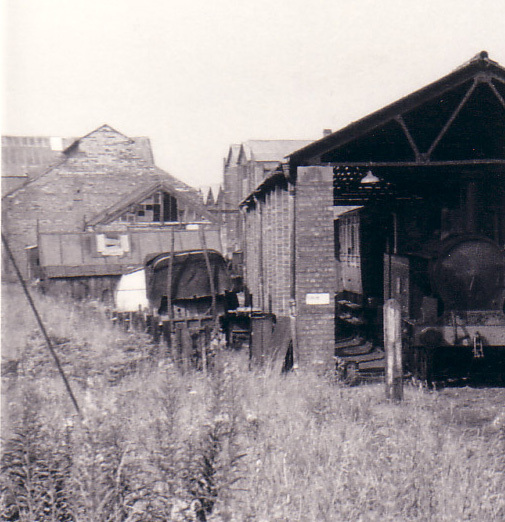 Trevor Cousens and Allen Civil visited Stewarts and Lloyds at Bromford Bridge to buy loco spares to replace parts on the Hudswell Clarke and the Barclay locomotives. Early in March 1968 some track was stolen from Chasewater. It has since been replaced and measures are in hand to prevent any further occurrence. A security compound will be constructed in the very near future to house the stock there. Slow progress has been made on the MR Royal Saloon, the clerestory roof has had pitch applied. The damp has caused the roof inside to crack up. We understand that work is now in hand to the two side panels which need attention. The outside is now being given a coat of undercoat. The LNWR TPO needs a good coat of red oxide, some of the woodwork needs replacing. The roof has had some attention and is more waterproof. The TPO needs a good sort out inside, with new relics arriving all the time, we are getting very short of room in this vehicle. A great number of relics have to be stored because there is not enough space to display them. The Maryport & Carlisle 3rd Class carriage is almost completed, the wheels need finishing with a white rim. The underframes require another two coats of paint. One door has been made complete by Frank Harvey and another door by Laurence Hodgkinson – this needs to be hung. It is hoped to move the Midland Railway crane to Chasewater in the near future, where it will be used for track laying purposes. This entry was posted in Museum & Artefacts and tagged Aldridge, Brownhills, Burntwood, Chasewater Railway Museum, Cheslyn Hay, Great Wyrley, Heath Hayes, Hednesford, Lichfield, Norton Canes, Old Railway Lines, Pelsall, Staffordshire, Steam Trains, Walsall, Wolverhampton. Bookmark the permalink.